Government of Pakistan Cabinet Secretariat, Establishment Division has issued Notification No. 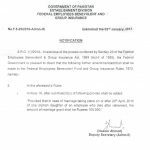 8/10/2013-E.2 dated 20-10-2014 in connection with Revised Assistant Packages for the Families of the FG Employees who die During Service. You can read the details of the same at the copy of the Notification. There are many pages in the PDF Format of this Notification. Is this package covers PTCL employees? The PTCL employees have been declared Autonomous body having major share held by Government of Pakistan by Hon'ble Sindh High Court and even by Supreme Court. Mera father health Dept me as a dispenser FATA KPK me kam kar raha ta.awr uska scala11 ta.awr 23/02/2015 ko fout ho gia ta.ab please ap hama ye bataya k ab ye mera father konsa package me ata ha .Fedral govt me ata ha ya provencial me jo 04/12/2015 ko PM SaHIB NE elan kia.awr konsa package k lia document jama kar daaa. Sis can you share new approved package???? Dear Mrs.Azam mughal still no latest notification issued. Dear Irshad Ghani Khan the orders are not cancelled but the orders have been held in abeyance and new notification is expected soon. However you can get the benefits according to previous orders of 2006. Can you please mail me a copy of notification regarding assistance package issued vide OU No 8/1/2011-E.2 dated 3 Nov 2011.
how can we apply in it?? are ther any helplines? AOA Plz mjy koi btye k ye pkg waki mly ga? agr mlna ha to kb tk???? any new updates about this pkg????? kindly tell me the current position of this pakeg please?????? Dear Asghar Khan still no latest updates as soon as i get the updates I ll share. Dear umer i m not confirm. Dear amna sill no latest updates. 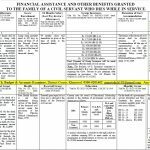 Revised Assistance package has been implemented from 4th Dec, 2015. Plz help me a FG employee has been died in 10/2005 is his widow eligible for a contract employment of 2 years? Tell me about any relevant ltr or policy of Govt of Pakistan....?? now what will be the date of implementation of this revised assistant package ??? because according to notification implementation date was 15-06-2013. Dear Adnan let's see the Notification when it is issued. Dear plz email me this detail alongwith the subject of the letter and department. from which date this package will be implemented??? 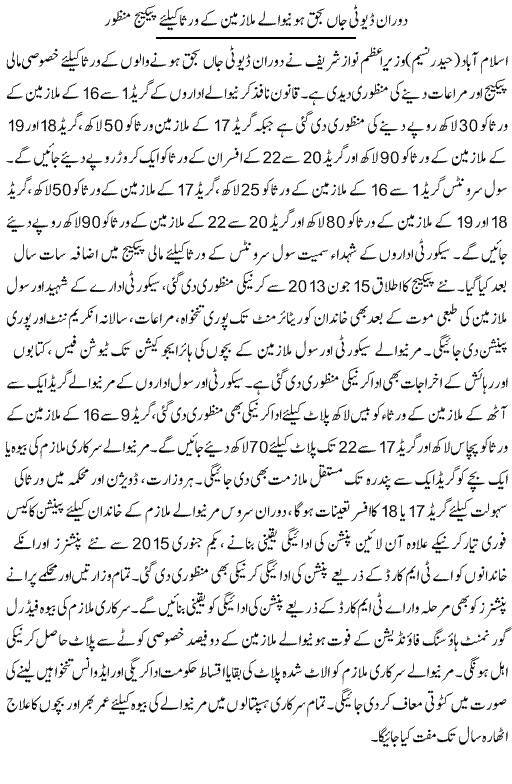 AOA plz anyone tell me what is latest news for assistant new package for on duty service? my father had been died on 19 november 2013, now a days we have need for mony. either this news is correct or wrong regarding this package?? Dear mehwish aqeel I hope soon the revised letter will be issued but there is no exact date for the same. i think there will no revised letter issued furthermore . The package was suspended since 9th Feb....any update about this matter??? Dear Amna i have heard that this packages is sent for revision being a huge amount. Thankyou much shomaila,may Allah bless you,any expected date,when will ammended package be announced? Dear Amna when the amended Notification is issued I ll share the same at this website. My Wife was hired on 1 Dec 2010 through FPSC and performed duties at FG Girls high school 22 No. Chungi Rawalpindi Cantt under FGEI Directorate. She died on 8th Jan 2015 after completing 4 yrs service. Which type of benefits her family entitled by Govt. Dear Ali Khan I think except pension and commute all benefits will be granted to the family. In notification related to Death during service by PM; Free education to one child up to the age of 18. 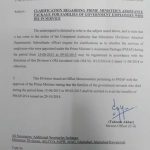 Dear Waqar I have only the Notification issued by Establishment Division in 2006.
aoa, i m Zulfiqar Ali Malik, i m still waiting for your response regarding my question of dated February 24, 2015, pl respond and also update the status of the committee constituted by the PM to revise the said package. 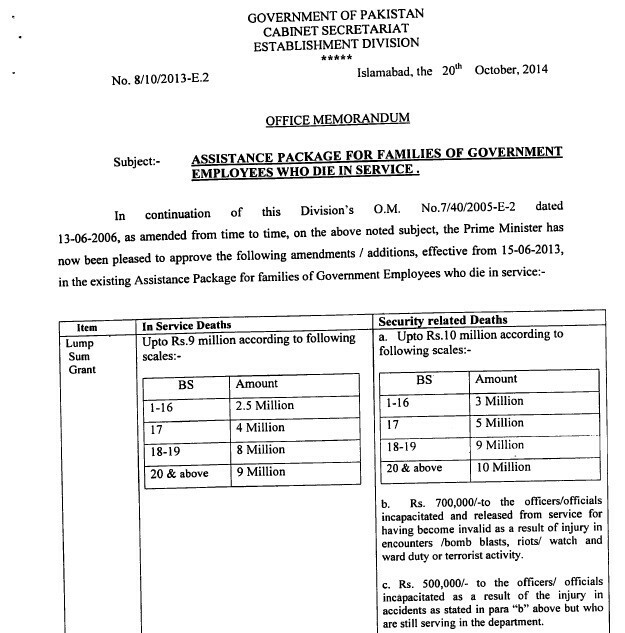 Dear Zulfiqar still no updates of the revised notification of Assistance Package for the FG Employees. I really appreciate your efforts regarding your this piece of work, may Allah reward for you this. 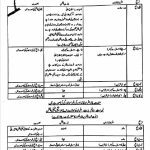 Dear Shumaila Kamal my father was federal government employe, he died on 10th Oct 2013, while on service, i have submitted application for grant of this package in my father's department two months before, but i havent receive any notification till yet. I myself was appointed in the department in deceased seat on two years contract basis, and i am desperately waiting for my regularisation order and other incentives of this package. Please can you tell me when will government issue the revised edition of the said package and till when will I get the all incentives. Dear Mohsin thanks for appreciating mine efforts. The exact date is not confirmed, however I hope the same Notification will be issued with the amendments of amount only. Thanks alot for the concern dear, i have followed you on facebook as well, kindly update your wall when the revised package is generated. May Allah reward you for all what you do for all government servants. Dear Ali plz email me all details along with the province/department. Khuda raha Ishaq daar sarkari mulazims ka khilaf q ha. Iss ko kisi ka ehsaas q ni ha. srf apni jaibain barney ki fiqr ha. lakhon logoon ki badduain lain gay. agr inno na assistance package kaam kia. ya to elaan hi na kartay. hum kia expect karin. meray father ki death hoe ha. nw when new announcement will come? My wife has served 4 yrs as FG Teacher SST and died in Jan 2015. Her family will receive pension or not. Dear Ali Khan I am not confirm about the pension, however your are eligible for other benefits. Dear please tell me when this Officially Notfication sent to all offices still no any notice to offices. Dear Umair, yeh to department hi jaanta hay. I hope soon it will be sent to all the concerned departments. I appreciate your efforts for doing a good job. Mam, I belongs to Sindh Province. I have some confusion about this notification that is it only for federal govt. employees or also for all provincial employees. Because I am listening that it is only for federal govt. employees not for other provincial employees. also listen that if provincial Govt. issue this revised letter then effective date must be changed like 214-15 not from said date 15-06-2013. Kindly let me clear about this? or if you have any knowledge about Sindh govt. notification pls share. Dear Junaid, I hope soon the provincial Governments too issue the same Notification but its date of validation not confirm. This notification has been issued by Estb.Div. All the 5 provincial govt hope that they will adopt the notification as early as possible. We will hope that the same notification will be issued but until their is no hope of any notification regarding the same as Estb Div. issued. I am thankful to u for clarification of my query. in your website urdu newspaper news from Mr Haider.Nasim already uploded in your website. All the points have been cleared. In the news paper clearly mentioned by the reporter Civilian grant or security related grants those are different. Dear Shahid, according to my knowledge security related death means death of the person who is assigned the duty of security related purposes. i.e a policeman etc. Dear Umar Soomro, I am not confirm about this policy. Dear Shumaila, Kya punjab government ye notification issue kray gi to ye apply bhi 15-06-2013 se hoga jaisa ke uper wala federal employees ke liye hai? Ya wo kisi aur date se apply hoga? My father (provincial servant) died at 31 July 2014. Kia kuch chances hain ke hum is package ke liye apply kar saken ge? Dear Faheem, I hope soon the provincial governments will issue the same notification. Dear Naveed, mujhay is ka confirm nahin hay. MY uncle died last weak.he was serving as sub-inspector in karachi place please tell me how much compensation and pension will his family get? Dear Arsalan yeh un ki Basic Pay, Service, Age aour Departmental packages per depend kerta hay. Dear Arsalan, it is 75% for the existing rules. I hope soon the letter of its amendment will be issued by the Sindh Govt. you need a lots of regards for this humble effort being untiringly done on daily basis. 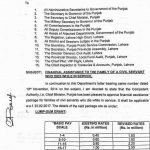 I want to ask that has Punjab Government also announced such package(assistance package for families of government employees) for Punjab Government employees)? Thanks dear Dr. Rafiq for appreciating my efforts for the employees. Dear I hope Punjab Govt as well as other provincial Govt will also issue the same Notification soon. Suppose when an employee died, his children were studying at very nominal cost lets say Rs.200/- per month, but after his death, the children were admitted in very expensive schools (like Grammer, Bacon) where per month cost is around 50,000/-. so will they be entitled for Rs.50,000/- p.m., pl clarify? Dear Ali it is a point to ponder over it. I hope its clarification will be issued soon. Welcome dear Major Hassan, yes it is in addition to routine pension/gratuity. Dear i want to ask can widow get encashment as she will receive pension as full pay. Is this case will process by pension department or Pension Cell. As during service death means person was getting salary and now his widow will get it. kia ab widow ko group insurance milay gi k ni or benevolent fund ki monthy grant milay gi k ni. Dear Adnan I could not understand your question. Plz in detail email me. A.o.a ma app sa ya pochna chahta hn k during service death ki waja sa ab widow pension full pay ki tarah draw karay gi. kia ab ossay encashment milay gi k ni. or group insurance or benevolent fund sa payment ho gi k ni in addition to assistance package. or BF ki monthly grant milay gi k ni. ab widow superannuation k baad pension par jaey gi tu ab widow ka case pension cell ma deal ho ga. ya pay section ma. Dear Adnan the widow will get all benefits as well as pension and gratuity. Pension Case will be dealt by pension department and some benefits will be dealt by Accounts Office and some by the Group Insurance & Benevolent Fund department. Just contact the office concerned where the employee work for details. 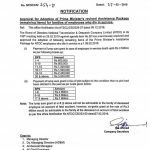 Dear Noureen the same packages are available at this website under the heading Packages For Employees. dear mam, my father is died on 22-12-2009.Are we eligible for this pakage. Dear Umir you are eligible for the previous package not this. Dear Naureen, You are not beneficial of this Notification. For instance, if a person, who is working in BPS-16 in some Federal Government Institution, dies for some reason during his service, what exactly his family will get out of this “Assistance Package”? I presume that his family will, probably, get the following. 1. His widow will get Rs. 2.5 Million as a Lump Sum Grant immediately after the approval of the concerned authority. Right? 2. Say, he was drawing a monthly salary of Rs. 25,000 in his life, so after his death, his widow will keep receiving the same amount (including time to time increments etc) till the deceased employee’s age of superannuation. Right? 3. After the age of superannuation, the widow will receive the full pension. What I want to ask, will she also be eligible to get the amount of gratuity? 4. His children will get free education upto higher level including tuition fee, Books, living allowances etc. What will his widow need to do for getting all this stuff from government? 5. His widow will receive Rs. 5 Million in lieu of plot of land immediately after his death. Right? 6. If the widow is a “Graduate”, she will be employed in BPS-14 after his death. Right? If yes, then will she keep receiving his salary that I mentioned in point # 2? 7. His widow will get Payable amount of GP Fund + 30% Bonus of the payable amount. Right? Dear Kamran Your Points 1, 2, 5, 7 are all right. Point 6- She will get new salary according to her BPS as fresh employee. Point 3- She will get pension as well as gratuity. Point 4- She must apply for this through the department. i want to know the permanent job for one person in deceased family is applicable to as in old package there is contract for 02 years. contract is awarded in July 2014. can we apply or refer to new package for regular appointment? Dear Farooq you should apply for the regularization from date of joining. If the death occurred after 15th June 2013. Is this policy applicable only on regular employees? Or employees on contract (against regular posts) may also benefit from it? Dear Kamtran, mujhay confirm nahin hay. but govt must think about a package for alive employees too. let me put in-front of you two scenario, what will be your opinion? 1)if a person passed away in december 2013, but his case already decided on older Assistance package. will his heirs benefited with newer provisions/amendments comes in this recent package? 2? A person died in 2007. but due to some reason unexplained, his case never opened/decided. his heirs approached court of law and court verdict came in favour of heirs in oct 2014. will his heirs benefited with older package or newer. waiting for your expert advice? 1- The heirs will get the remaining amount i.e the earlier amount will be minus from the new amount. 2- The heirs will get the benefits according to the old rates. Wapda employees are also covered under this package??? Dear Ahmad if the WAPDA employees were covered under the existing packages then they are also covered under this package. And this package is applicable from which date? Dear Ahmad it is applicable wef 15-06-2013. What is meant by in-service death? Does it mean death during office hours? Dear Ali, in service means during duty hours and also when he is at rest at home 24/7 but upto his retirement. 24 hours a day are included in the service. Dear Madem is there any likelihood of Punjab Govt to issue such notification? Thanks. Dear Waseem I hope soon all the provincial Govt will also issue the same Notification. My father was a school teacher in Punjab and he passed away March 22, 2012 and his some of cases (group insurance etc) is still pending due to corrupt system. Will we get any benefit from this legislation. Dear this package starts later than 2012.
what about the Monthly Benevolent Grant of the deceased employees who were getting this grant before june, 2013. will it be increased or remain same?? Dear Naveed it will be clarified soon. let me clarify, for in service death(normal) it will remain same however for security related death it will be increased as per PM latest directive. a special lump sum grant is also applicable to security related death. Dear Shafiq, I think, it is for all the Federal Departments who are cover under benevolent & Group Insurance. for employees working in federal autonomous bodies, the said package is applicable to those who adopted Basic Pay scale(BPS) in toto & off course subject to approval of Board of directors. commendable effort from NS government, must be applauded. Dear Rehman, it is really a appreciable effort by the NS Govt as the families of the employees will get now millions (Carores) Rupees as assistant.